In the locker room at the University of North Dakota football stadium, a handful of people wait for an early morning rain shower to pass so they can test a small four-rotor helicopter on the football field. 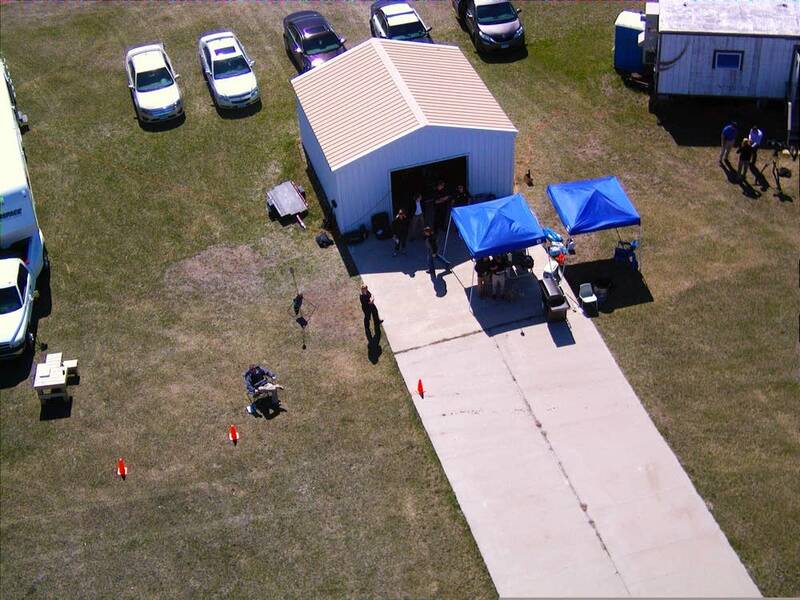 As the clouds pass, the crew of university researchers and police snap together the 3-foot-long, 5-pound helicopter in an unmanned aircraft training exercise designed to show how small drones can help fight crime. It's flown by controls on a tablet-like device that also shows a live video feed from the drone's on-board camera. Small drones could save police time and money, but privacy advocates worry they might also make it easy for police to spy on people. 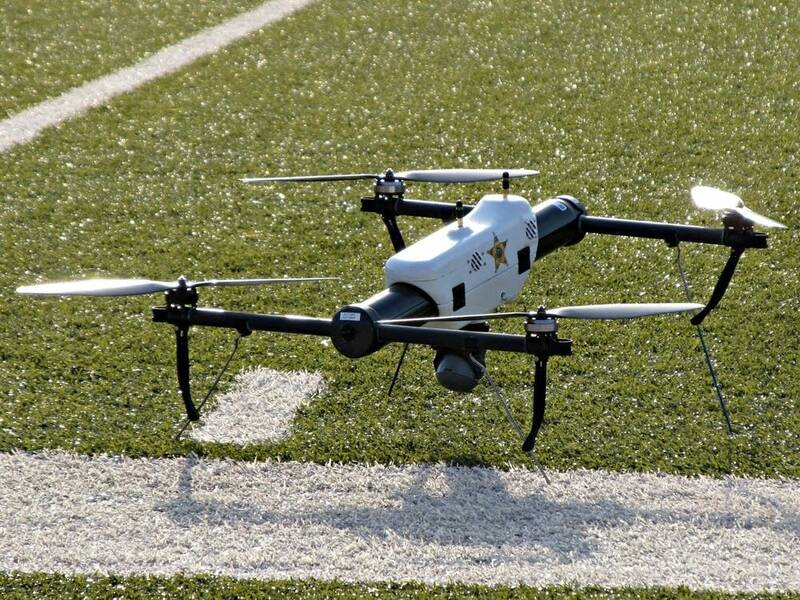 • Today's Question: Are drones OK for crime fighting? 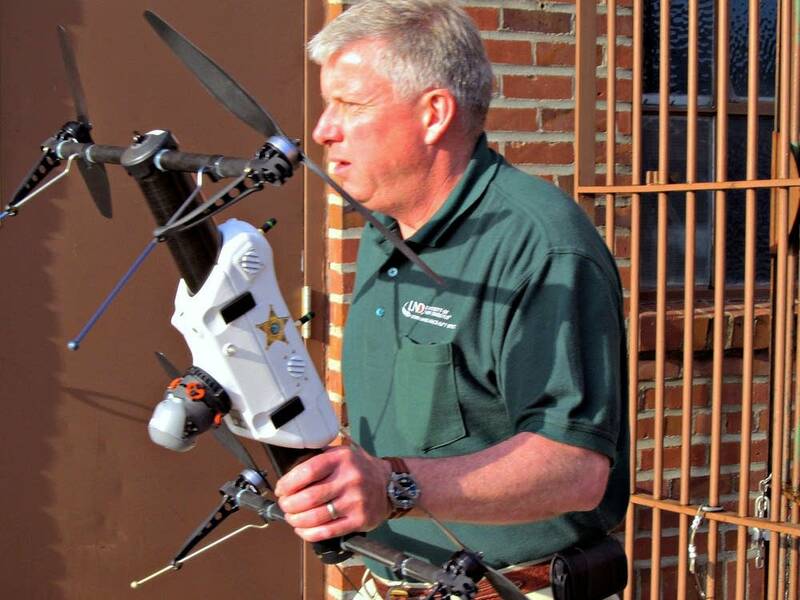 The Federal Aviation Administration has granted a special permit for the Grand Forks Sheriff's Department and the University of North Dakota to fly drones in 16 North Dakota counties, where they are training officers to use the drones. A special permit is required because the FAA has not yet developed rules for the use of small drones. 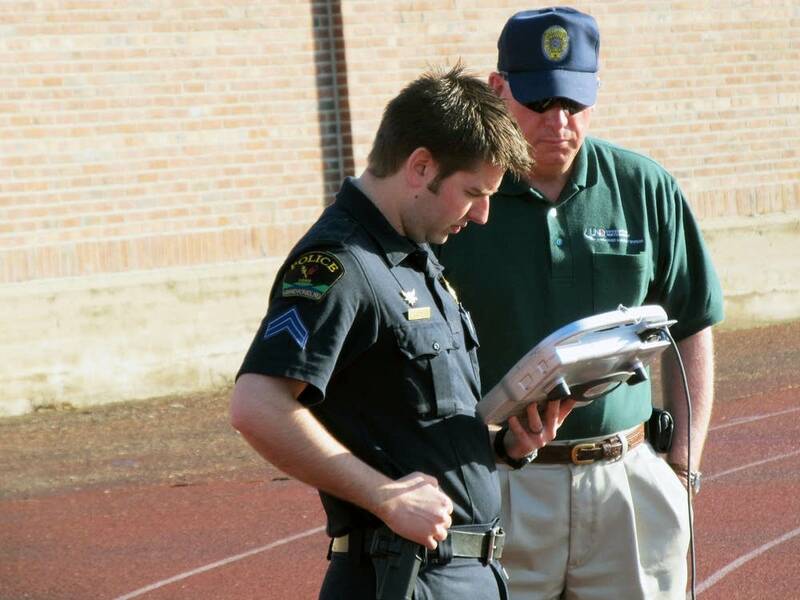 In the recent training scenario, a stolen vehicle being pursued by Grand Forks police crashed near the university football stadium. "By the time the patrol unit got here they saw him going over the fence and into the main stadium football field area here," explained Al Frazier, a Grand Forks deputy sheriff and assistant aviation professor at the University of North Dakota. "We believe he's somewhere in the stadium and he's a felon suspect, unknown if he's armed." Frazier said the small helicopter is nothing like the high-tech unmanned aircraft flown by the military and the U.S. Border Patrol. "You can buy better cameras off the shelf at Best Buy, so we're not utilizing whiz-bang Flash Gordon technology," he said. "It's off-the-shelf technology. We're just employing it from an aircraft that is able to get us a couple hundred feet up in the air where we get a different perspective on the incident." 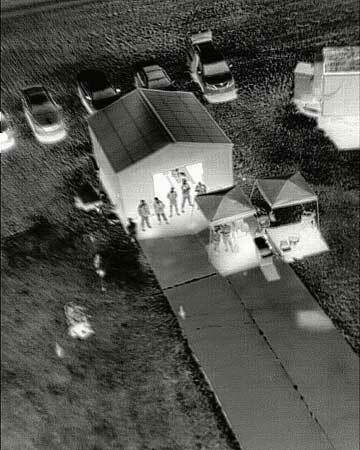 The helicopter carries a video camera and an infrared camera that shows objects based on temperature. It doesn't take long to find the "suspect" hiding in a corner of the stadium. If this search were real the unmanned aircraft system, or UAS would save time and protect officers, Grand Forks police officer Tim Schuh said. "Without the UAS, we would have had to slow search this entire field, exposing officers to potential danger," he said. "Whereas here, we confine him to a small area, now we can approach a small area with less officers, with less exposure." So far, the small helicopter has been used in only one real incident, the search for a drowning victim. But Schuh, who is trained to fly small unmanned aircraft, expects the demand to increase as police officers and firefighters become aware of what the drone can do. He said the primary uses will be searching for missing persons or fleeing suspects, or taking crime scene photos. Schuh said officers will be cautious about how the drones are used. He said if a police officer can't look somewhere they cannot use a drone to do so. The U.S. Supreme Court has ruled if a police officer riding in an airplane sees criminal activity, it is admissible in court. The use of drones has yet to be been tested in court. A university committee made up of professors, law enforcement and community members will monitor the use of drones in the research project. But Schuh doesn't expect to run afoul of Fourth Amendment's protections against unreasonable search and seizure. "Because nothing is really changing in law enforcement," he said. "We still have all of the privacy issues, Fourth Amendment issues that we have to follow. So this doesn't really change that. It simply changes the perspective on which we look at something." Some legal experts and privacy advocates worry that, unless there are strict rules governing the use of unmanned aircraft, small drones will make it much easier for law enforcement to covertly watch people on private property. The FAA is developing rules for commercial use of drones, and agency officials have said protecting privacy will be part of the new rules expected to be finalized next year. Public perception is an issue project manager Frazier knows is important if small drones are to become a useful tool for law enforcement. He said the university and the Sheriff's Department are committed to being transparent, and hearing from the public. "You know I think it's almost an unwarranted fear the public has that we're going to be peeking in their windows," he said. "I'm not aware of an unmanned aircraft mission in the nation yet that has resulted in that kind of evidence. They've all been public safety, humanitarian type missions and I think that's really where the strength of this technology is." Frazier will take the small aircraft on the road this summer, doing show-and-tell for police and emergency responders in 16 eastern North Dakota counties where the FAA allows the aircraft to fly.